Our story all started on a beautiful day in the Fall of 2014. It was October 15th and my beautiful baby boy was just 3 days old and we were released to leave Winter Park Memorial Hospital. Because of financial reasons, we decided to cloth diaper our little guy. It was unknown and lonely waters as not a single person I knew used cloth diapers. Family and friends all thought I was crazy for trying it and was told that I wouldn't stick with it. What those people didn't know, we didn't have a choice. My wonderful husband, Sean, was taking on the difficult task of now supporting a family of 5 All. By. Himself. I didn't even know how we were going to make it. I was terrified. Our finances on thin ice, I recovering from a traumatic c-section, and I was a MOM! The realization that I was now responsible for this precious life was surreal. I had no idea what I was doing. This is where Kelly Martin steps in, the owner of Baby Bottoms Boutique. As if the word owner could encompass all of what this wonderful woman is. Throughout the last couple of months of my pregnancy, I endlessly emailed her, asking a million and one questions about this taboo thing we HAD to venture in, of cloth diapers. Kelly was ever so patient with me, answering all of my concerns and reassuring me that it was all going to be ok. So, we set it up and committed to getting a Cloth Diaper Newborn Rental for 3 months. We went for the 3 months in hopes that we could get enough money saved up to fund our little Isaiah's fluff. In order to maximize our time with the rental, we arranged to pick them up the day we were released from the hospital. So here I am, feeling like my body will split apart if I dare stand straight or move in any direction, fresh new baby in tow, and we make our way to Amaya Papaya. We initially intended to have Sean go in, pick up and go, but the diapers hadn't been dropped off yet. So we parked the car, Sean took Isaiah inside, out of the heat, to change him. I very slowly hobbled my way across the street into a place I unknowingly would one day call home. Here is where I met the amazing Yolonda Tyler. All I can say is "Wow!" I came in and was greeted so graciously and with such sincerity. That's not something that I'm used to experiencing in this rough world we live in. I filed that thought away as I was trying to focus on moving one foot in front of the next. She offered me a seat and I slunk down in the first lounger near the play lounge entrance. By then, Sean comes back out with the baby and places him in my arms. I looked around and asked Yolonda, "Is there somewhere I can breastfeed the baby??" For those that knew me before I had Isaiah, you'd know I was very modest when I came to showing off my skins. But in a way that only Yolonda could say, she tells me, "Feed yo Baby!". 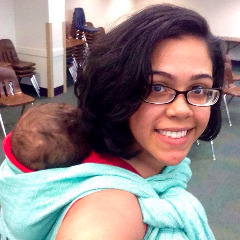 Those 3 words from a complete stranger, empowered me and gave me the courage to publicly breastfeed my child for the first time. In that moment, feeling physically and mentally defeated from labor and delivery, I felt STRONG! I felt confident. I told myself, "I GOT this!". Fast forward to January 2015, I go in to drop off my cloth diaper rental and pick up our package of our first diapers. We were picking up 12 diapers. I, like a kid in a candy store, took my time and picked out all the different colors I wanted. Isaiah was snuggled up in my Moby wrap fast asleep. Now let me share something with you that took me aback. When I came in the doors of Amaya Papaya on that day, Yolonda did something that no other business owner has ever done to me. She. Remembered. Our. Names! And maybe to someone else, that may not seem like a big deal, but it meant the world to me! This is the second time she'd seen us and she remembered us and when we first came in months back. I admire her, I can't even remember if I'm wearing my pants that day but not Yolonda. She remembered my family. Now we jump into February. I was running a few errands nearby and decided to stop in on a Tuesday. I had heard that a baby group had started up and wanted to check it out. I didn't have a dime on me, no work, new baby, you know how it is. When I walked in, there wasn't a single person there. I thought, "huh! oh well". So I took the opportunity, since I was already there, to take a small glance (yeah right lol!) at Baby Bottoms Boutique and all the lovely fluff. Yolonda asked, as I perused Heaven on earth, if I had come for Baby Buddies. Sadly, I said no as I had no money to pay for it. I also thought to myself, "even if I DID have the money, what's the point of taking an infant to an indoor playground??" Boy! Was I wrong! She decided to let us come in and do the Baby Buddies program, just for Isaiah. I was like, sure, why not. I didn't want to be home, that's for sure! First thing she asked was if I had done bubbles with him. I was like, "noooo, he's a little baby." I never even thought as that being something to do with a newborn. So she pulled out this biiiig rainbow parachute, got the bubble machine in place, and we sat little man down in one of the Prince Lion Heart chairs smack dab in the center. She read to him a story about a little rubber duck. Man! What a great story teller! Even I was into this little cardboard book! Then she turned on the bubble machine and sang her bubble song. Isaiah was absolutely fascinated! Trouble is, when the bubbles would get near his face, he'd hold his breath. Weirdest thing I've ever seen! She carefully would wave away the bubbles and sang to him. Then she took out a wooden box of different colored scarves. One by one, she pulled them out, teaching him about colors and playing hide and seek. He was entranced. It was as if I didn't even exist, he was so fixed on his Mrs. Yolonda. We've been hooked on AP ever since! Shortly after, I was offered to become an AP Ambassador. I was now volunteering at a place that had become my home away from home. Yolonda put value in a place I never thought I'd have the chance to visit until he was a toddler. Her passion for children, the care and concern for her guest and the people of the community is astounding. These 2 women, Kelly and Yolonda, have touched my family in a way I don't think they could ever understand. These powerful, hard working mom's inspire me to be better. To reach out to other people and help them as I have been helped. I love the community that we have built and love seeing it continue to flourish. Seeing all the moms and dads come every week to Baby Buddies gives me such joy in knowing, we have each other. We all lovingly support each other, you all are so beautiful. 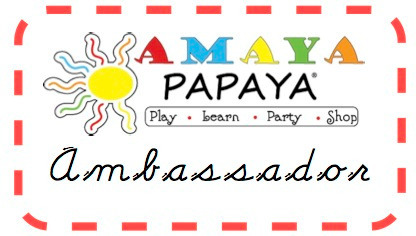 Today, I am proud to say that I am a Baby Bottoms Boutique and an Amaya Papaya Ambassador! Ashlei King is also the Happy Mama Orlando for Happy Family Brand Foods. To learn more about the Amaya Papaya Ambassador program check out our Get Involved webpage.